When your squash club is closed for a week for "painting", you assume that scuffs will be whitewashed and holes poly-filled. After missing nearly a fortnight of games, I was keen to get back on to the newly-pristine courts - maybe they would have even scraped the mould out of the corners! After walking up the "tunnel" (anyone else play on courts whose entrance is akin to a nuclear bunker? ), the pungent result of a week's labour had a strangely motivating effect as I bounded up the steps to court 2. Only I found that the court walls had not been painted at all. The brickwork above, to the side and EVERYWHERE ELSE BUT THE WALLS OF THE COURTS had been painted - the shade of choice being "light mustard". 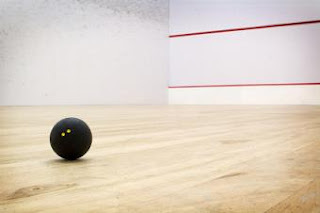 So for the squash player, the week's closure had made no improvement whatsoever to the quality of the facilities. I hope squash fan Richard Wilson hasn't a hit scheduled here this week - he wouldn't belieeeve it!